Since my sons are still just seven and three years old, my coverage of history books for kids doesn't usually get out of the picture-book genre. But I'm enough of a general nonfiction reader myself that occasionally I run across something for older readers that I have to mention here (and save for my own children till they're a bit older). 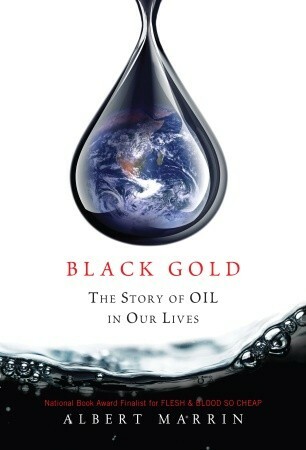 The history of oil—that is, the petroleum kind—doesn't seem at first like much of a topic for a children's-book author. It's complicated, chemistry-laden, and politically, well, explosive. But the subject is, one must admit, one of the vital ones of our time, and writer Albert Marrin has taken a crack at a short history for middle- and high-schoolers of the greasy, precious stuff and humankind's interactions with it in Black Gold: The Story of Oil in Our Lives. It's an ambitious crack at that, starting with the geological and chemical science of how oil and the other fossil fuels come to exist. Marrin then moves chronologically through man's first fleeting brushes against these powerful energy sources, up through the explosion (that word again) of their use beginning in—fueling, actually, if you will—the Industrial Revolution. It's a remarkable achievement, presenting this much information in such digestible fashion, and in a mere 181 pages. And when Dash or Griff in future years comes to me saying he has a report to write for school on oil, or energy in general, this is the book I'm going to send him to first.